Happy National Poetry Month! I hope you have been filling each and every day with at least one poem. If you haven’t, I’ve got the cure for that: 30 Days of Poetry from Cuyahoga County Library. Also, if you happen to be in the Canton, Ohio area tonight, I’m participating in Writing Knight’s sWord Fight: my first live poetry competition! As part of the prep, both myself and my worthy opponent, Greg Milo, produced videos to promote the event. Well, in all fairness, he produced a video while I asked my son to create mine. I wrote a rough script with a little joke thrown in, told him it was supposed to be funny and over the top, and I didn’t want to actually appear on film. My son ran with it. I think he did a great job! Anyway, I hope you enjoy it. sWord Fight Tournament in Canton, Ohio. I will be a “combatant” in my first live poetry competition: Cat Russell versus Greg Milo! Come by, and wish me luck! This competition will be at a different venue than usual. Local Author Fair at Massillon Public Library, 208 Lincoln Way E, Massillon, Ohio 44646. I am scheduled to read briefly, and I will also have books to sell at my table. I will be donating 10% of any sales I make this day to Project Gutenberg! Latitudes Poetry Night and Open Mic at Compass Coffee in Akron. Kave Coffee Bar in Barberton hosts an open mic every Thursday. I’m not scheduled as a guest, but I do plan to attend. I will be reading from my newly published book of poetry, Soul Picked Clean, as my talented artist-friend, Jim Meador, paints his version of Van Gogh’s Sunflowers. The eventbrite link is now live; all tickets must be reserved ahead of time. 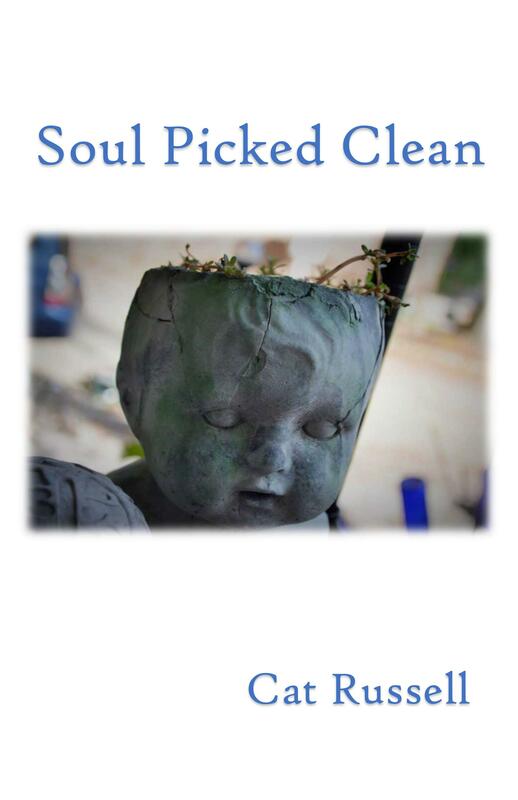 This is a paid event, but each ticket includes a free copy of Soul Picked Clean! Cat Russell Author Talk with music by Ed Amann at the Barberton Public Library, 602 West Park Avenue, Barberton, Ohio 44203. Ed Amann and I will alternate between his music and my poems. What better way to celebrate Shakespeare’s birthday than to attend a poetry reading?! 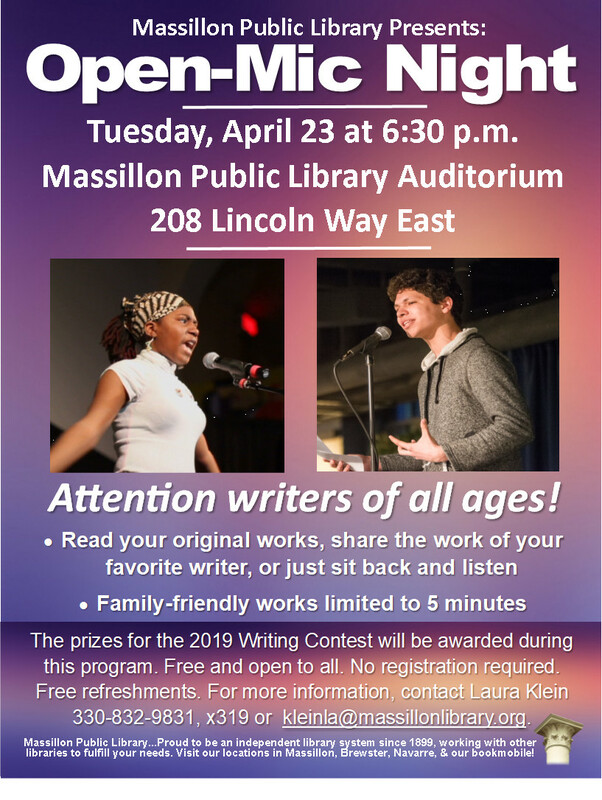 Massillon Public Library will announce the winners of its April Poetry contest at the Poetry Night and Open Mic! I’m not specifically scheduled, but I do plan to attend. I love libraries! Spoken Word Showcase (paid event) hosted by The Outpost concert club and Writing Knights. Ed Mabrey will be the feature performer, supported by Kisha Nicole Foster, Black Reign, Keith Allison, Finn Thrace, SuperTeam, and Luna Annunaki. The Write Stuff Authors’ Group meets monthly at the North Canton Library to workshop WIPs before adjourning to TD’s Grill at about 7:30pm for general literary merry-making. Western Reserve Writers’ Conference Any writers in the area should definitely attend this FREE writing conference at Cuyahoga Library’s South Euclid-Lyndhurst Branch. I will not be reading, but I will attend, and I’d love to see you there! Thank you for visiting my blog! I wish for you a month filled with poetry, and I hope to see you at one of these events soon! *video created by Christopher Russell aka Rastabon.